Home > News > Diane Meier Receives Lienhard Award From National Academy of Medicine for Driving Awareness and Adoption of Palliative Care Services in U.S.
Diane Meier Receives Lienhard Award From National Academy of Medicine for Driving Awareness and Adoption of Palliative Care Services in U.S.
For her leading role in driving awareness and adoption of palliative care services in the United States, the National Academy of Medicine (NAM) today awarded the Gustav O. Lienhard Award for Advancement of Health Care to Diane Meier, professor of geriatrics and palliative medicine, Icahn School of Medicine at Mount Sinai, New York City. The award, which recognizes Meier’s achievements with a medal and $40,000, was presented to her at the National Academy of Medicine’s annual meeting in Washington, D.C.
To help promote the advancement of quality palliative care, Meier established the Hertzberg Palliative Care Institute at Mount Sinai, which was a model program to help patients and families navigate the complexity of illness and devise strategies for managing pain and other symptoms. As a clinician she published widely on palliative care in major medical journals, developed guidelines and national quality standards for the field, and educated the general public about the need for palliative care through the media. Her efforts have spurred impressive growth in the nation’s palliative care capacity; there are now over 1,800 programs in the U.S. dedicated to this type of care, and more than 80 percent of people in U.S. hospitals have access to palliative care teams. “Meier’s tireless work as a researcher and as a clinician has resulted in reducing the pain and emotional distress of countless individuals and their families struggling with serious illness,” said National Academy of Medicine President Victor J. Dzau. 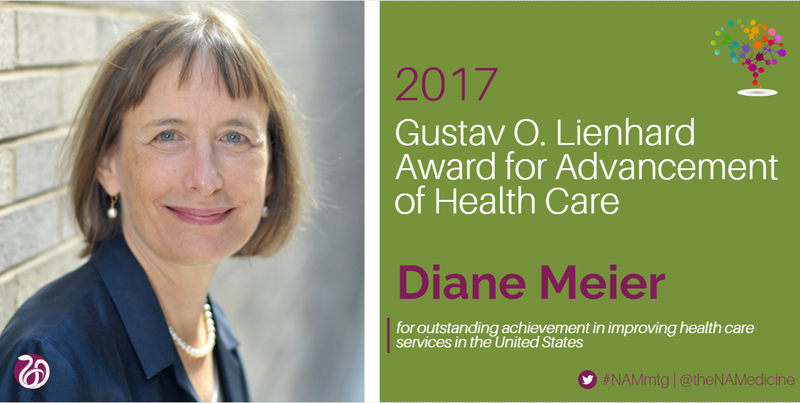 Meier is the 32nd recipient of the Lienhard Award. Given annually, the award recognizes outstanding national achievement in improving personal health care in the United States. Nominees are eligible for consideration without regard to education or profession, and award recipients are selected by a committee of experts convened by the Academy. This year’s selection committee was chaired by Regina Benjamin, NOLA.com/Times Picayune Endowed Chair in Public Health Sciences at Xavier University of Louisiana. The Lienhard Award is funded by an endowment from the Robert Wood Johnson Foundation. Gustav O. Lienhard was chair of the foundation’s board of trustees from the organization’s establishment in 1971 to his retirement in 1986 — a period in which the foundation moved to the forefront of American philanthropy in health care. Lienhard, who died in 1987, built his career with Johnson & Johnson, beginning as an accountant and retiring 39 years later as its president. Additional information about the Lienhard Award can be found here.